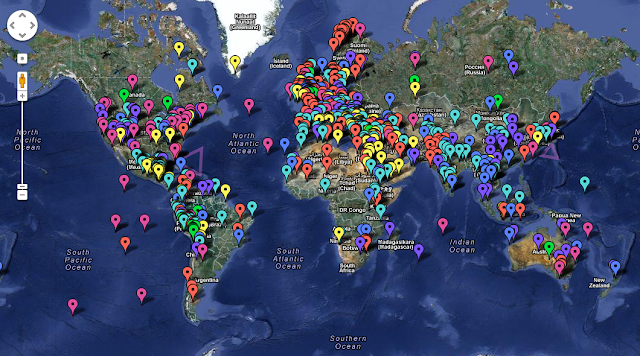 Global crowd-sourced overview of archaeological sites on Google Maps, making archaeology accessible for everyone. Working on the Marcahuasi Project has brought me all over the world, from behind my desk - I've never discovered so many new things in such a short period of time, especially not on this kind of scale. Usually, when someone refers to archaeology, the only monuments they are ever able to mention are Stonehenge and the Pyramids at the Giza plateau, whereas I was interested in finding out just how many of them are out there. 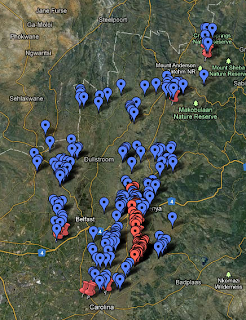 Searching all over the web for more locations I could add to it, I came across Michael Tellinger's presentation of the South African ruins during Megalithomania 2010, which were discovered by Johan Heine. 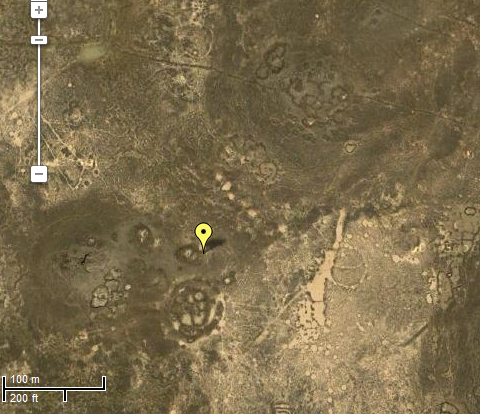 Fascinated by the stone circles he had found, I started marking them on the Marcahuasi Project - which lead me to the discovery that they stretch on for over 40 kilometers. I thought I had seen it all, and continued with my search for more locations to add. However, what I came across next was definitely not something I was expecting. In an article written by Owen Jarus from Livescience.com, it said they had discovered "ancient geoglyphs" in the Azraq Oasis, stretching from Syria to Saudi Arabia. "They stretch from Syria to Saudi Arabia, can be seen from the air but not the ground, and are virtually unknown to the public. They are the Middle East's own version of the Nazca Lines — ancient "geoglyphs," or drawings, that span deserts in southern Peru — and now, thanks to new satellite-mapping technologies, and an aerial photography program in Jordan, researchers are discovering more of them than ever before. They number well into the thousands. 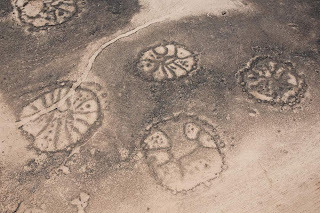 Referred to by archaeologists as "wheels," these stone structures have a wide variety of designs, with a common one being a circle with spokes radiating inside. Researchers believe that they date back to antiquity, at least 2,000 years ago. They are often found on lava fields and range from 82 feet to 230 feet (25 meters to 70 meters) across." When I came across the article, I was hoping to discover some new geoglyphs to add to the Marcahuasi Project. 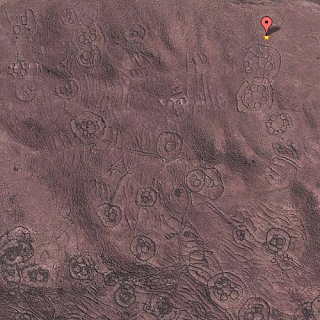 However, when I saw the picture, I soon realized that I wasn't looking at ancient geoglyphs - I was looking at the exact same structures found in South Africa! Obviously, I was shocked, and decided to comb through the Azraq Oasis to see if this was a mere coincidence, or if there was more than a few similarities between the two to be found. Imagine the look on my face when I discovered that the area covered by the ruins in the Azraq Oasis by far exceeded the South African ones! 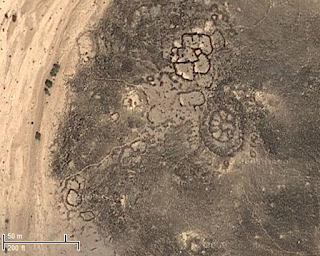 By taking the sheer amount of ruins scattered all over the Azraq Oasis into consideration, I am convinced that we are not dealing with geoglyphs, but settlements of sorts -- Since most of the ruins are located on the edge of the now dried up rivers, which would be ideal conditions for a civilization to inhabit at the time, more evidence of actual settlements rather than geoglyphs arises. Please note that not all of these structures are stand-alone ruins. 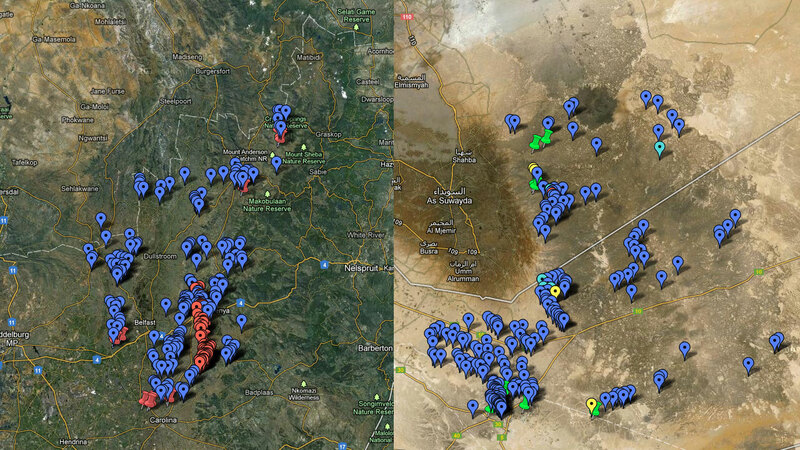 There are multiple locations where there is clear evidence of people building their settlements near each other. 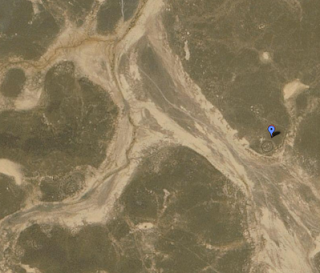 The image below clearly shows how they purposely built multiple settlements next to the river. Seeing as the ruins cover an incredibly large area, I wouldn't shut out the possibility of them traveling down the river in order to reach others. It also suggests that fish was an important part of their diet, if you ask me. Here is another close-up of one of the settlements to show the incredible size of the structure. - Of which most are conveniently located alongside the (now dried up) river. Are these traces of a long-lost civilization? Just how old ARE these ruins? Each marker on the map represents a different historical location. What is the Marcahuasi Project? 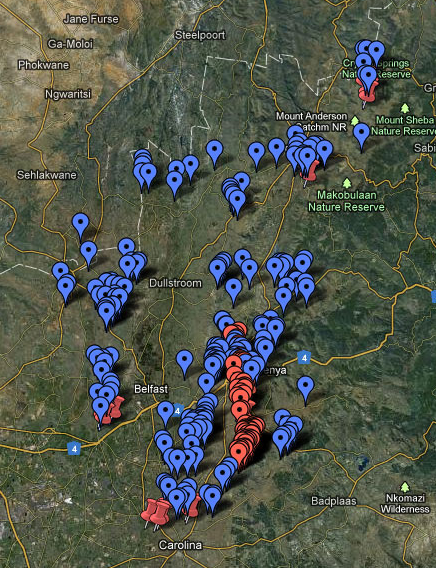 It's a crowd-sourced collection of markers on Google Maps, representing archaeological, historical and religious sites throughout time aswell as geoglyphs, mysterious, and natural places of interest. 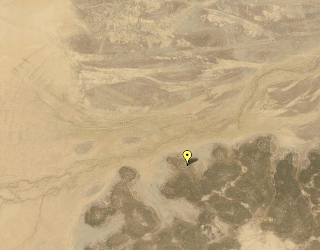 There's literally hundreds of these locations out there to be discovered! What do the markers represent? 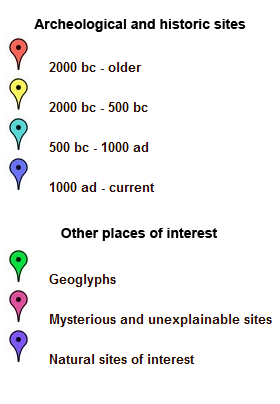 There are 7 different colored markers, each one representing a different type of site. Why did you make this?I wanted to learn more about our history, yet couldn't find anything that made it easy to browse through historic sites and other information. So after watching multiple documentaries and reading dozens of articles I realized that I could be keeping track of the sites I already read up on by marking them on a Google Maps project, allowing me to slowly but surely gain a global overview.